This luxury suite is decorated in natural colour tones with a calming atmosphere , air-conditioned and has a plunge pool, overlooking the Estate vineyards and mountains. It is easy accessible and features contemporary style décor. In-room features include: private bathroom with free standing Victorian bath, separate shower facility, single vanity, WC, minibar, tea/coffee facilities, in-room safe and a flat-screen TV with satellite channels and Free WIFI. This luxury suite is decorated with vibrant colour tones, air-conditioned and has a plunge pool, overlooking the Estate vineyards and mountains. It is easy accessible and features contemporary style décor. This luxury suite is decorated with a monochromatic colour tone with a hint of gold, air-conditioned and has a plunge pool, overlooking the Estate vineyards and mountains. It is easy accessible and features contemporary African style décor. 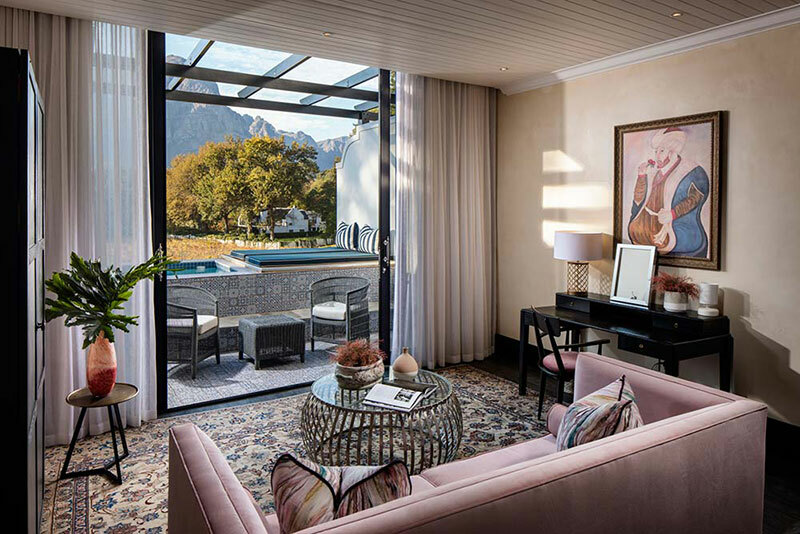 This luxury suite is decorated with a soft pink colour tone, air-conditioned and has a plunge pool, overlooking the Estate vineyards and mountains. It is easy accessible and features contemporary luxurious style décor. This luxury suite is decorated in royal blue and white, air-conditioned and has a plunge pool, overlooking the Estate vineyards and mountains. It is easy accessible and features contemporary Royal style décor. This luxury suite is decorated in shades of green, air-conditioned and has a plunge pool, overlooking the Estate vineyards and mountains. It is easy accessible and features contemporary Tropical style décor.